Let the professionals at Averie Construction handle all your painting service needs. We have the experience and training to get the job done right. At Averie Construction, we take care of the interior and exterior painting needs of homes and businesses, so if your property could use a lick of paint, give us a call today. Why Hire Averie Construction For Your Painting Job? There are many reasons to hire a professional company for your painting project, but here are a few reasons why Averie Construction is your best bet. Averie Construction has been in the painting business for a while now, and over the years we’ve worked on painting jobs that range from single room apartments to multi-floor commercial spaces. We’ve encountered just about every possible layout for a home or business, and have the skills necessary to get the job done, leaving you with an even, perfectly-executed paint job. 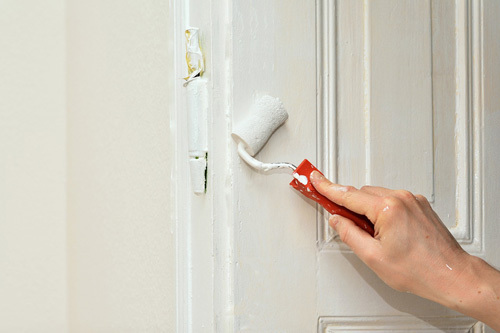 Even with small painting jobs, the costs can pile up without you noticing. It’s more complicated than buying a can of paint and a brush—you need primer, drop cloths, the proper brushes, and various other things that cause an unexpected jump in price. With Averie Construction, the price we quote you on covers everything from start to finish, so you don’t have to worry about any nasty surprises when you get the bill. We take care to always be consistent with our painting, so the end product is a beautiful, even coat. Say goodbye to streaks or smudges, with Averie Construction’s professional touch you’re guaranteed to be happy with the final result. Before we start to paint, Averie Construction will take the time to carefully move anything in the area we’re working in safely out of the way, so it can stay paint-free. When we’re done, all your belongings will be moved back to where we found them; apart from your expertly painted walls, you won’t even notice we were there! Beyond experience, there are many reasons why Averie Construction is a top choice in town for HVAC services. Our staff always works hard to finish a project well within the agreed upon timeframe. We understand that your time is valuable, and won’t waste a second of it. When we enter your home or office, we treat everything with a high degree of care. With the variety of HVAC systems out there, you need a company that knows its way around yours. We’re constantly educating ourselves on any new systems, all so we can serve our clients better. We are committed to complete customer satisfaction for all projects, so if you aren’t entirely satisfied with the work, Averie Construction will work hard to correct the situation. Whether you’re in the market for an accent wall for your home, or for a fresh coat of paint for your entire office, Averie Construction has you covered. Our business is based on the values of honest, straightforward work, reliability and customer care, regardless of how big the project or budget is. With free quotes and efficient service, there’s never been a better time to give your office or house a bit of a facelift with Averie Construction’s painting services. To get your free quote, get in touch with Averie Construction today! To learn more about how a fresh coat of paint can improve the quality of your property, get in touch with Averie Construction today. Your source for Local, Professional, Painting Services.